Our handyman technicians have experience in a broad range of home improvement areas. 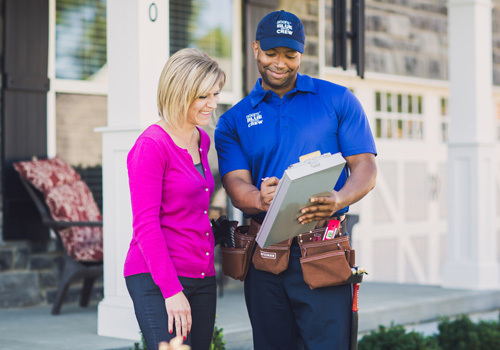 From building decks to fixing plumbing issues, a Sears Handyman technician knows how to help with minor to intermediate repair tasks. Keeping up with your home's maintenance is important, and many things require constant care and attention. For all of these time-consuming renovations and repairs, trust Sears Handyman Services with the jobs that are beyond your own expertise. We all need a little help sometimes. Give us a call at (740) 201-1265. Minor electrical issues don't require the attention of professional electricians. When these issues are too difficult for a homeowner, Sears Handyman Services has experienced technicians ready to take on your home's electrical repairs. For the repair or replacement of ceiling fans and other lighting fixtures, our technicians are equipped to help. We can also install recessed and LED lighting. For help with these electrical jobs and more, call Sears Handyman Services. It's very likely that your home has walls constructed with drywall. While drywall is sturdy, portable, and an overall favorite material for construction workers, it is susceptible to damage. For example, a door flung open a little too hard could result in an obvious crack or break. Additionally, it can look quite unsightly if punctured by nails. For a range of drywall repair needs, simply contact Sears Handyman Services. We're experienced in patching, taping, repairing, and hanging drywall by using the existing material or starting from scratch. A deck provides a relaxing setting for a nice summer barbecue and family get together. Caring for your deck requires plenty of effort and is a huge responsibility. If that job is too big for you to tackle alone, call our handyman technicians. We can repair decks with wood rot or build a whole new one for you. Additionally, if you need help preventing water damage or staining your deck, our technicians can do that too. Fences provide multiple benefits to homeowners, from marking property lines to providing some much-needed privacy from nosy neighbors. Whether you are looking for a decorative picket fence to enhance your home's curb appeal, a tall privacy fence so you can sunbathe in seclusion, or an economical chain link fence to keep your pets safe and secure, Sears Handyman Services can handle the entire installation for you. Sears Handyman Services can provide the inside and outside of your home with a fresh, new paint job. Painting can take up a lot of time and many people may not be comfortable with using ladders, which is where we come in. Give us a call so we can get started on rejuvenating your home. We can also prepare existing walls by removing wallpaper. For help with these tasks, and plenty more, you can rely on our handyman professionals.